At BCA we take our duty to provide students with high quality careers education, along with independent and impartial careers information, advice and guidance very seriously. It is essential in preparing our young people for their futures, whether it be university, employment or an apprenticeship. Inspire young people to succeed in their careers. Increase motivation, leading to improved exam results. Improve decision making by increasing pupils’ knowledge of the world of work. Reduce young people’s anxiety about the future. The Gatsby Benchmarks are a framework of 8 guidelines that define the best careers provision in schools. BCA has planned and is developing its careers programme around them. CEIAG is delivered through the curriculum, during tutorial times, dedicated guidance meetings and accessed by all students throughout the year. Careers Education is delivered through the “Respect Programme” in BCA’s Tutor Time Programme. All year groups from 7-11 experience a series of lessons related to careers, allowing them to reflect upon their own skills and interests in relation to possible future careers. There is plenty of additional support at the end of Key Stage 3 to help with decisions about subject choices and in Year 11 when deciding on which pathway is appropriate on leaving BCA. BCA employs an independent careers adviser for two days each week through CareerConnect. His main role is to hold individual careers meetings with Year 11 students, providing impartial information, advice and guidance. He also runs targeted group work focusing on aspirations and pathways with all other year groups. All students are entitled to book appointments and our adviser targets specific groups of students (Pupil Premium, SEND, pupils referred by pastoral leaders and those identified by the RONI report provided by Warrington Borough Council). He is easily accessible to students as he is located near to the Heart Space on the first floor and therefore is always available to see students on a drop-in basis. Throughout the year, different cohorts of students are targeted based on their year group. The careers adviser is also available at all parents’ evenings and open evenings throughout the year. September to February: All Year 11 students have a one-to-one interview with the careers adviser to discuss suitability of options for the following year, which includes consideration of possible future careers. Follow-up careers interviews are arranged in those cases where it is determined that students would benefit. March to July: Year 10 groupwork takes place, looking at pathways including further education, apprenticeships & higher education. Targeted interventions also take place for students in Years 7, 8 and 9 aimed at raising aspirations and broadening horizons. Certain cohorts of students are targeted at parents’ evenings, such as high level learners, early in their time at BCA. We feel that our engagement with employers, colleges and universities is a real strength of the academy. Three large events run every year, these are a University Fair, Careers Fair and Mock Interview Day. University Fair: To raise aspirations and to promote higher education BCA holds a university fair in the autumn term. The following institutions attended the most recent event: BIIMM, University of Bolton, University of Central Lancashire, Chester University, Edge Hill University, Harper Adams University, Huddersfield University, Leeds Trinity University, Liverpool University, Liverpool Hope University, LIPA, Manchester University and Oxford University. Careers Fair: This is held in the Summer term and all students from Year 7 and above were invited to attend. Last year, companies and organisations attending included: Astra Zenica, Sellafield, The Bell Group, Schneider Electric, Thermofisher, Cogent Skills, The Locker Group, Interserve, Capita, PDSA, Army, Royal Navy, O2 and Sainsbury’s. Mock Interview Day: Run in the Spring term this event seeks to prepare all Year 10 students for the challenges ahead. The interviews are out of students’ normal comfort zones but provide stretch and offer space to talk over their aspirations with someone from the world of work. At least 15 members of the local business community support this event. Mentoring takes place in Year 9 with the Elevate programme and the Unlock mentoring scheme in Year 10. Both schemes are aimed at raising aspirations, goal setting and boosting self-esteem. Beamont Collegiate Academy completes the (CEC) Careers and Enterprise Company’s Compass benchmarking tool which evaluates careers provision against the 8 Gatsby benchmarks. Feedback is gathered form external providers and students following careers and enterprise events that take place throughout the academic year. Examples of this being the annual careers fair, HE/FE fair, Mock employment interviews, enterprise days and 1 to 1 guidance interview. Data is collected throughout the academy based on the intended destinations of Year 11 students. These are all reported to Warrington Borough Council. Students at risk of becoming NEET are identified very early on, using the RONI report, and these students are given priority appointments with our careers adviser and, where necessary additional interventions, such as CareerConnect’s Life Goals project in Years 10 and 11. 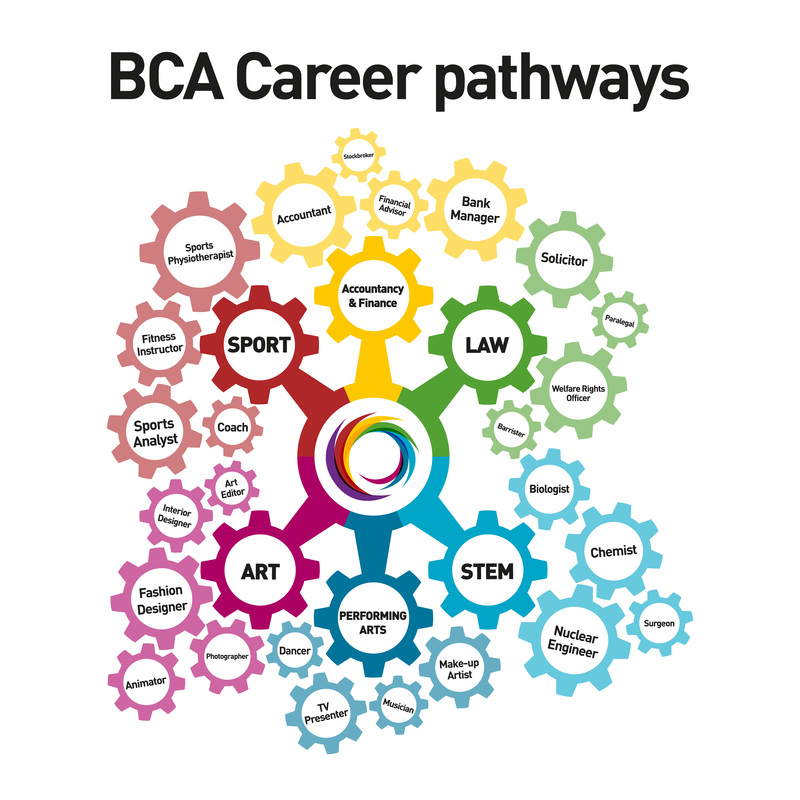 We have a number of career pathways at BCA Careers in STEM: where students on STEM routes visit employers from STEM industries giving them an excellent insight into this area of employment. 15 students in Yr 11 and 12 students in Yr10. All students in Yr8 (180) and all in Yr 7 (210) study a 20 lesson DEC taster course. Wates provided professional links to industry. Being involved in a drone survey of existing roof, site surveys, numerous site visits to the new build, health and safety briefings, professional architect tuition to staff and students in a professional environment within the classroom where students are always commenting on the fact that the projects in this subject feel real. Sports leaders trained & participate in leadership/coaching/umpiring courses. Visit to Etihad Stadium for Stadium tour & classroom session on Sports Technology, fitness, training and nutrition for professional sports. Chester University for lecture on Sports science and physiology and a tour of the University. Preparation for a professional career in the arts. Freelance professional dancer will working with students on creative & contemporary work links to career pathways in Dance. LIPA workshops on Dance, Drama, Music and Costume design, culminating in a performance. Advice on careers in the Performing Arts Industry. Audition for Liverpool Institute of Performing Arts (LIPA) in year 10 & 11. Directing workshops with professional actors and director. Role plays with Manchester Metropolitan Police training team. Large management team organise, coordinate & administrated events. Visit to events Organisation Company. Attended Priestley College and participated in a mock trial. Tour of the college and a ‘Law of Murder’ taster lecture. How to get into top universities – an insight and a forward thinking plan for this academic goal. 16 PP, HLL from Year 10 went to the Emirates, Old Trafford Conference Suite. Students listened to speakers from PiXL and from top Universities about what it means to study at universities, how to decide where to go, what “top” universities mean (differentiating between the Russell Groups and those that are top in their fields); they gave tips and ideas on building portfolios of learning, evidence and experience that would set them in good stead for applications processes. They discussed long term preparation and planning as well as giving more detailed information about funding etc. Year 9 students, had a talk from a language analyst from GCHQ (Government Central Headquarters) representative about how language analysts work to support the government protecting the UK. Pupils were surprised by how useful languages can be and asked some great questions to our visiting spy! Afterwards, everyone participated in a language taster session in either: Russian, Italian or Arabic, learning about both the language and culture of the countries where they are spoken. The links below provide information on a wide range of topics and will be useful in identifying options and support decision making. The National Careers Service has a range of information on making choices, career planning, courses, apprenticeships and information on writing CVs and completing application forms. CareersBox offers an online library of careers films, news and information. This website contains information on the massive range of job opportunities in the NHS. General college information including the range and type of courses offered. The government’s apprenticeship website has a range of information on becoming an apprentice and local and national apprenticeship vacancies. The universities central admissions service has details of UK university courses, with information on the application process, finance & support. A website which compares different universities and courses. Prospects has information on graduate jobs and careers. The group represents the UK’s 24 leading universities, the website is a good source of higher education careers information & advice, including ‘informed choices’ a downloadable guide to making post 16 choices. This website highlights the variety of opportunities that exist outside of university. A range of information and advice for young people. Take the Buzz test and in less than 5 minutes discover what your strengths are and get an insight in to your personality. Explore options for careers, university or apprenticeships and get help applying successfully. teenagers aged 15-17 to discover who they are and what they can do. It’s your chance to explore, be inspired and find your passion. Information from experts on a range of careers topics.